At least 74 people, many of them children, have been killed by devastating wildfires raging east of Athens, Greek authorities said Tuesday. The fast-moving blaze forced many locals to race into the sea into a desperate bid to escape the flames. Hundreds of survivors have been rescued by boat. The fires broke out Monday afternoon and have raged amid bone-dry conditions, fanned by strong winds, on three main fronts in the Attica region east of the capital. 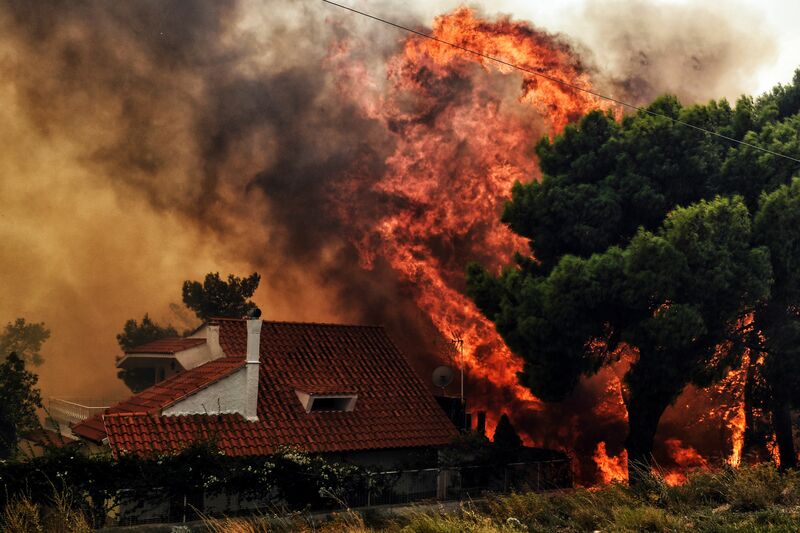 The inferno surrounded Mati, a popular seaside resort destination for Greek families about 25 miles north-east of Athens. The flames sent people scrambling to the sea for safety. Others didn’t make it, separated from the ocean by walls of fire. In one location, emergency workers came across the horrifying discovery of the bodies of 26 adults and children huddled together a short distance from the water. “I was briefed by a rescuer that he saw the shocking picture of 26 people tightly huddled in a field some 30 metres from the beach,” Nikos Economopoulos, head of Greece's Red Cross, told Skai TV. Authorities said nearly 700 people were rescued by the coastguard from the beaches, where they had taken shelter from the flames, and another 19 were pulled alive from the water. More than 180 people were injured, with 11 in intensive care. More than 700 people have been evacuated from the area. A state of emergency has been declared in Attica as hundreds of firefighters work to control the blazes, with European neighbors sending help in the form of helicopters and additional firefighters. The fires, the worst to hit Greece since another outbreak killed dozens in 2007, forced Greek Prime Minister Alexis Tsipras to fly back early from a state visit to Bosnia Monday night. “Attica is facing a very difficult night. The combination of intense winds and multiple parallel fronts has created an unprecedented extent and difficulty for firefighters,” he told reporters Monday. Speaking to Sky News, Interior Minister Panos Skourletis called the blaze a "biblical disaster with human losses." Authorities say they will use a drone from the U.S. to look for any suspicious activity in the region, given the possibility that the fires could have been deliberately lit. Much of Europe has been sweltering under extremely sweltering condition, including record-setting temperatures in northern Scandinavia. Amid the baking heat, Sweden has also been battling unprecedented wildfires, prompting it to also call for international assistance.